The A9 Trunk Road provides a vital link between Inverness, Wick and Thurso in the north of Scotland. The A9 between Helmsdale and the Ord of Caithness follows the steep topography and the road has a poor horizontal and vertical alignment. The relatively high percentage of slow moving Heavy Goods Vehicles combined with the poor geometry prevent safe overtaking. 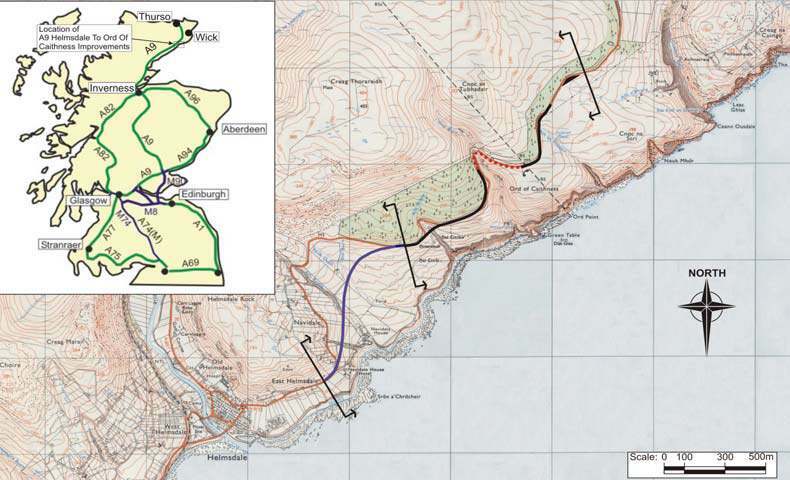 Improvements to the A9 are to be carried out in two phases; Phase 1 from Allt Briste North to Allt an Fhudair and Phase 2 from East Helmsdale to Allt Briste North. This brochure describes the Phase 1 improvements, which start in August 2004.
sight lines will be improved and a retaining wall will be replaced. At the Ord Burn, the works carried out on the A9 in 1998 will not be affected. The improvements recommence at the existing lay-by north of Ord Burn. The most significant change being the removal of the poor road geometry at Allt an Fhudair burn crossing. The offline improvements at this location will provide a smoother alignment with improved visibility. Beyond Allt an Fhudair the improvements tie into the existing A9, some 200m to the north. Other features of the improvements include snow shelter belt planting north of the Ord Burn to prevent snow drifting onto the road; a picnic area within the redundant carriageway at Allt Briste North; lay-bys on each side of the new road at Allt Briste North; modification of the existing lay-by north of the Ord of Caithness and remodelling of the existing box cutting to the north of Allt an Fhudair. The Works will also include sympathetic landscaping of the new and redundant roads to blend with the surrounding landscape. This project is being promoted by the Scottish Executive Enterprise Transport and Life Long Learning Department and is partially funded by The European Regional Development Fund. soft verge width of 1.65m.